All it took was 18 days of 2016 for me to be hit with an injury. Not any ole injury that comes with an awesome story, no it was so simple as me falling face first into a sidewalk. Nothing fancy and more like embarrassing but this is me. I have these moments. This moment left me with a concussion. So I’ve decided Janaury is just a trial month. 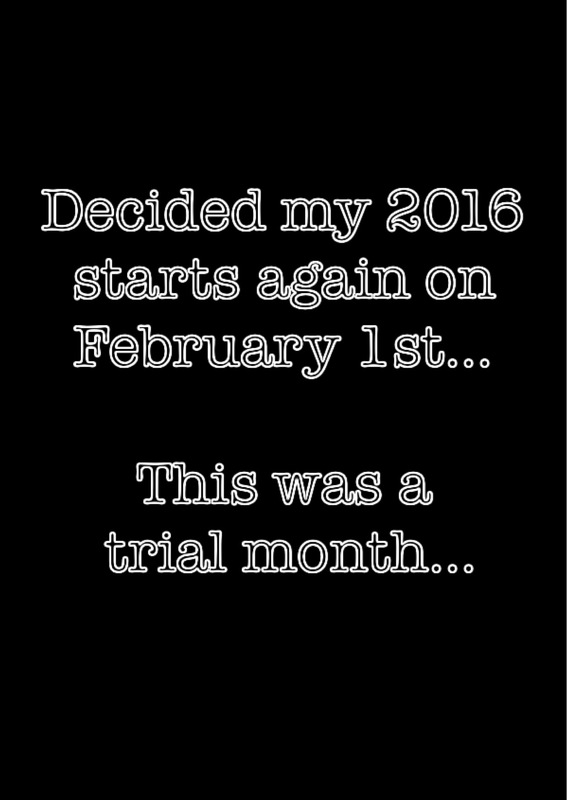 My 2016 is restarting on Monday. Fresh start and fresh chapter. Flipping a calendar month. I’m in the middle of training for Disney Princess weekend. I know I won’t be running my best but I’ll be running with my heart. I am on hold for training until the headache and concussion side effects are gone. I’ll be back. I’ll do my best but mostly I won’t be giving up. So bring on February. New goals, new chapter and mostly fresh starts. I’ll be a princess, even if I have to crawl! When you look at this statement, what do you honestly think? Do you think, this is not me… but really, are you sure? Ask yourself this: when was the last time you did something for others over yourself in a run, or just in general? When did running and life become a game that we are playing against each other? I’ve seen a spike in people competing against others in runs, boosting about their times over someone else, it is almost like an adult playground turned to bullying. We don’t go out and race a run, we go out and run. We don’t race each other, I don’t look at the person beside me in the corral going “I’m going to beat you”. Cause really what are you beating them at? Your time or theirs? Or looking at them and wondering how they ended up in this corral. You’ve never ran a mile in their shoes. You just don’t know. So what gives you a right to judge? Nothing does. At the end of a run, we all crossed the same finish line, maybe you just got there faster over someone else, but do you need to gloat that in their face? You are a smidge better athlete. End of the day we all are equal. I got the same medal as you and ran on the same streets. We are united. When was the last time, you started in a corral that is the back of the pack? Saw true struggles? Saw someone fighting just to keep the right and left foot going? When did you last encourage a runner as you zoomed past them? When was the last time you said “screw it” for your own time and just went to the back of pack to help someone who doesn’t believe in themselves? Who needs the extra push from a stranger? I see all these posts of “it was a crappy run… only 4:33/km”, really who is that crappy for? If all your SM posts are distance and time, are you not missing the finer things? How about telling us something you saw, like a child playing, or a dog chased you. We all know you’re a superb athlete, so show us something new! So you keep bugging me about not running outside, but wait don’t judge me that I don’t run outside. Did you know I had pneumonia TWICE in 2015 and still don’t have full lung capacity back? Running is a struggle, but I don’t give up. So did you want to run that mile in my shoes yet? So next time you go out for a run, think long and hard in what you post to SM how it can help someone in our big running family. We are all one big family, supporting each other, you support your own children, spouses, siblings etc, so we are no different. Don’t draw a line in the sand, to where your kindness ends. None of us are going to win an Olympic medal or whatever else you can win as a runner. So here is my thing congrats you’re a runner, but there is more to you then being a just a runner. Inspire someone, help someone. But mostly don’t lose the fact that you are you. At the end of the day, we all are runners. Running doesn’t discriminate against anyone, regardless of your shape, size or age. So don’t forget we all are equal and on the run to the same finish line. How can I even express how much it means to me that this amazing company has taken me on under their wing and made me a part of the team… well I can’t. BUT I can tell you that I love NUUN and the whole lot of products they have to offer. Anyone who gets me knows I need to avoid sugar, so you never will see me drinking crap like Gatorade or any of those “sports” drinks. Just check out this list of products and what they offer to each of you, including those in the back of the pack like myself. It is a product that every level of runner or athlete can use. For us Canadians, you can buy this product locally at MEC, Sports Chek, Tri & Run Sports in Trenton, Ontario, but check with your local running shops. When I applied to become an ambassador for this company, I was seeing who else was applying by way of SM, and I truly was thinking “I don’t stand a chance”. I’m not elite, my main goal is just to finish, and get the last half of any run across the same finish line. This is why this company is truly amazing, because they saw me as an athlete. I shall do all my Nuun teammates proud. The back of the pack is represented!